Permissions on SharePoint lists are set at the list or item level. 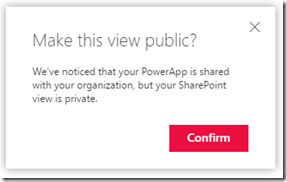 There are no SharePoint settings for permissions on a specific view. 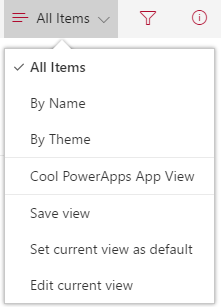 PowerApps are surfaced in the views dropdown. PowerApps permissions are set at the App level. Are you there yet? Did you make the connection? Yep. You can have an item in the view dropdown with permissions different than the list itself. You can now have a ‘view’ with its own permissions. PowerApps are even integrated enough to *not* show up in the dropdown if you are a user that doesn’t have permissions to the App. 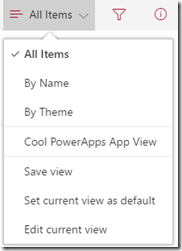 Now, PowerApps are not as simple to create as a SharePoint view, but it is possible. Currently two facts hamper users a little bit here. The current SharePoint to PowerApps ‘wizard’ only creates a phone layout App. Not something that easily replicates a traditional SharePoint view. Don’t get me wrong, this template (wizard) is awesome. it just doesn’t do what we’re talking about (replicate a list view) in this scenario. PowerApps are not yet embedded in the SharePoint interface – so the user experience is not as smooth as we’d like it to be. I have to believe that both of these issues are on the roadmap for the PowerApps and SharePoint teams. We’ll just need to wait and see if and when they work their way up the list. Until these are addressed, you have a few things you can do manually with SharePoint and PowerApps. I’m walking through some of the options and steps with this blog series (References listed below – still have more posts to come…). 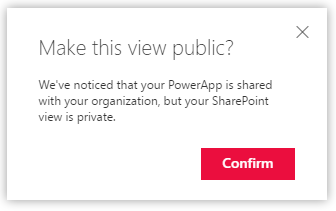 Although, you don’t actually have to do the ‘obscurity’ approach though since we have the capability of setting appropriate permissions at both the SharePoint and PowerApps levels. These are a few of the configuration options. Check them out to see if the integration between SharePoint and PowerApps can meet your particular needs. If it doesn’t now, by bet would be that it will eventually… soon even. Raymond and I did a presentation at the July 13th Minnesota SharePoint User Group a few weeks ago: Microsoft PowerApps and Flow: Overview and Integration Points with SharePoint. We had a nice crowd of 70-80 folks between the people in the room and folks that participated online. Links to the presentation slides and recording (TBD) can be found on the MNSPUG site. NOTE: In our slides we mention the connector for Office 365 Video. 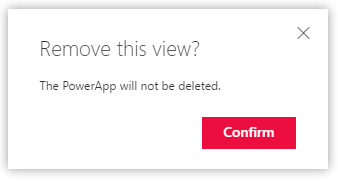 Right now there is an issue with that connector working with the current version of PowerApps. This is a known issue and Microsoft is working to resolve it. Microsoft is generating a LOT of interest in these two new technologies – both still in Preview (now, and when the presentation was given). With the Ignite conference coming up this Fall, I’d be surprised if there isn’t more to see by conference time – between polishing the release version, adding new features, and potentially releasing one or both of the products. Stay tuned. In my session at today’s Minnesota SharePoint User Group (MNSPUG) we had a question about the SharePoint App Store and if there was a feed available so that folks could keep up on what’s out there and when new apps are added. The short answer appears to be No. At least for now. The closest we’ve got to a ‘feed’ is the New Apps for SharePoint section on this page. At the bottom of the page we’ve got categories to work with, but we’re likely better off going to search and using the search refiners, which should produce the same results. Each of the apps has a Released date. Maybe Microsoft can add a sort based on that field to help us find new items. We’ll see. There aren’t that many apps listed yet, but hopefully they’ll be added on a regular basis going forward as the 2013 platform adoption increases. With Microsoft’s Bloomington Minnesota office moving to Edina, the Minnesota SharePoint User Group meetings will be moving as well. The next meeting on November 9th and all meetings after that (I believe) will be held at the Microsoft Technology Center (MTC) location in Edina. Hopefully they’ll get information about the new location, parking, etc. on the MNSPUG site soon. The new location worked out very well – holding everyone without too much crowding (other than a few really popular sessions), with free parking and wireless access available. A nice upgrade from our previous digs. We also had a Kinect play area during the day. Presentations are now available on the site for download. Keep an eye on the official site for updates and news about the fall “ScarePoint Saturday” event – tentatively scheduled for October 29th. A big thanks to Sarah Haase for overseeing the organization of the event, as well as to all the sponsors, volunteers, and attendees.